The journey began ten years ago when my partner/husband, Dennis Davis and I went to a convention in Atlanta, GA of Desert Storm veterans suffering from Gulf War illness. There we met the eight main women in our film. An immediate and personal bond of trust was formed—these veterans blossomed on camera and told us stories of their lives as Desert Storm soldiers and now as sick veterans. These interviews have become the heart of the film. Carol Williams, a mother of two and often in a wheelchair, soon became the focus of the film with her outspoken observations and outrage at how the VA system is mistreating female Gulf War veterans. She opened her home in Macon, GA to us and was able to share the most intimate and personal details of her life on camera. 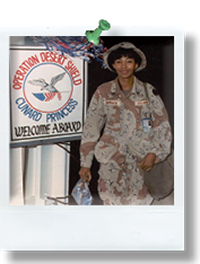 Since we started filming “Women At War: Forgotten Veterans of Desert Storm,” the current wars in Iraq and Afghanistan have seen more women serving in the military under combat conditions. The modern military is comprised of approximately 15% women. When they come home, they face problems with homelessness, PTSD, and suicide as did their Operation Desert Storm fellow veterans. It’s tragic that so little has changed for women veterans and veterans as a whole in the past 20 years. During the filming, I saw first hand how the VA has mistreated the female veterans in our film over the years and made it a mission to convey the women’s sense of betrayal and outrage to an audience. The struggles and stories of these women veterans are being told for the first time. Female veterans often fade into the woodwork when they come home. But these Gulf War women are on the front lines with their outspoken words, courageous actions, loyalty, and sacrifice. Over twenty years later, their war is not over. Like the myth of Sisyphus, they keep pushing that rock up the mountain and start over again when it falls to earth. A disturbing and appalling metaphor of these brave and relentless female Gulf War veterans who battle on, with broken bodies, determined to win their war.